In this article i will show you how to run the RIP (Routing Information Protocol) among juniper routers. when you configure the RIP on junos by default it will enable RIP v2 & this is one of the difference from Cisco where you need to configure version2 manually. 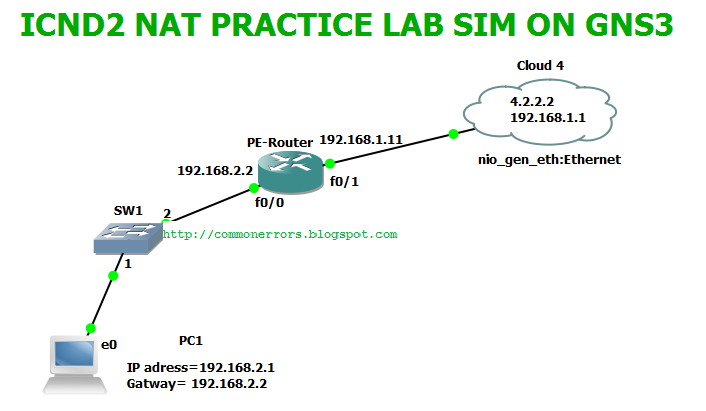 I have simulated this lab on gns3 which is one famous network simulator. For juniper simulation i have used junos olive only for study purpose and junos olive is not suitable for any type of commercial use. Gns3 Labs detail are as mention below but you can use any versions of these software. 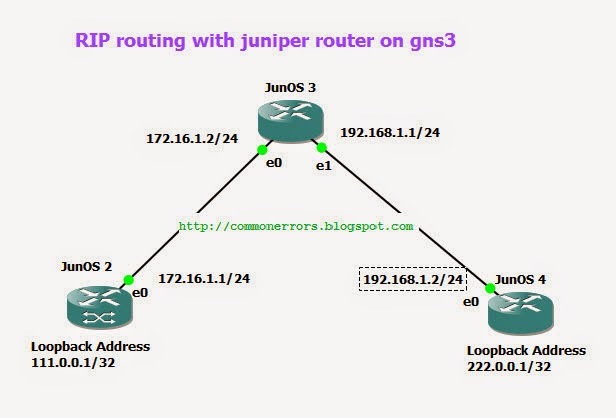 If you want learn more about the configuration of junos in gns3 you can visit how to configure junos on gns3 and Juniper commands. Configuration of RIP on junOS is very simple, you need only few commands and then good to go..:). By default JunOS don't advertise RIP routes & the routes received from neighbors, so we need to define a routing policy for advertisement of RIP routes. You can start configuring JunOS2 in following way. where rip-routes is the group name, which you can set it of own choice and em0 is the connected interface of Junos2. Where "advertise-RIProutes" is the name of policy. now you need to apply this policy with following command. Useful link: how to save current configuration in junos. 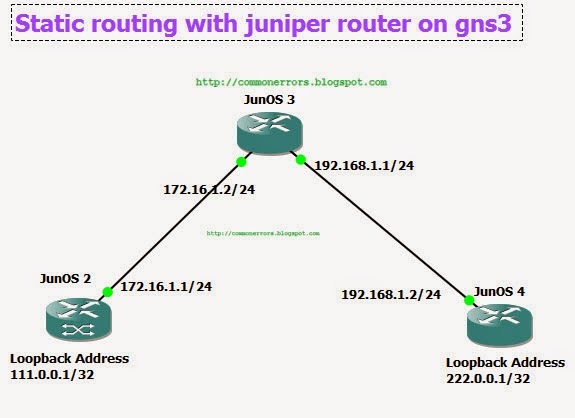 In this article i will show you how to configure static routing with junier router on gns3. For configuring static routing you need to define the route as static and with a next-hop address with it. Please note this lab is performed only for study and practice purposes using Junos olive , which is unsupported and unsupportable platform & it is not suitable for any type of commercial use. Configure static routes between all routers so that they can communicate with each other. 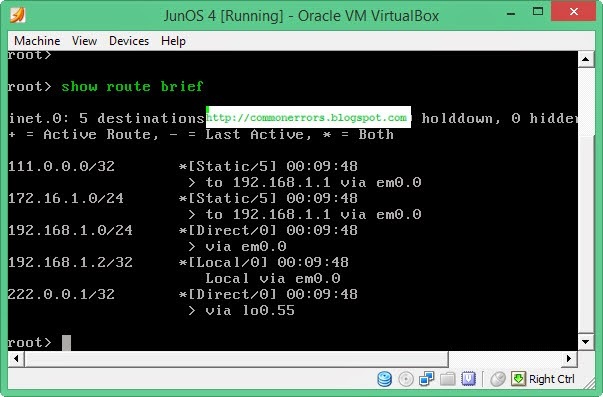 you can visit how to configure junos on gns3 and Basic JunOS commands. 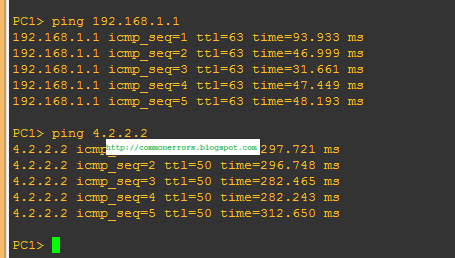 For setting ip address of interface you need the following commands. On junos2 111.0.0.1/32 and 172.16.1.0/24 are directly connected networks whereas 192.168.1.1/24 and 222.0.0.1/32 are remote or destination networks and inaccessible from junos2 . You need to configure static routes for making these routes accessible on junos2. Nex-hop address is 172.16.1.2 for all these routes. 111.0.0.1/32 and 222.0.0.1/32 are inaccessible networks on junos3 and need static routes. Nex-hop addresses are 172.16.1.1 for 111.0.0.1/32 and 192.168.1.2 for 222.0.0.1/32. Nex-hop address for all routes on junos4 is 192.168.1.1. Ping from junos2 to 222.0.0.1 should be successful. juniper router running JunOs have the default user name "root" with not password. Whenever you want to commit or save some changes/configuration using commit command & no password is set for root user then it will show you the above error that is "missing mandatory statement 'root-authentication' "
and you will need another try with a password having letters and numbers..
How to Email or upload .exe with gmail | Blocked for security reasons! As a security reason to save you from viruses and from other malicious software Gmail has blocked to send or receive .exe files. Similarly you can't send zip file having executable files or .rar file within a .rar or zip file. wherever you upload such file you get the message "Blocked for security reasons! " If you need to email an executable file (.exe) and you know that this is not a harmful file, you can send it by following method. Step 1-Show file extensions: If your operating system is windows 8 then open the folder that have the exe file which you want to email. 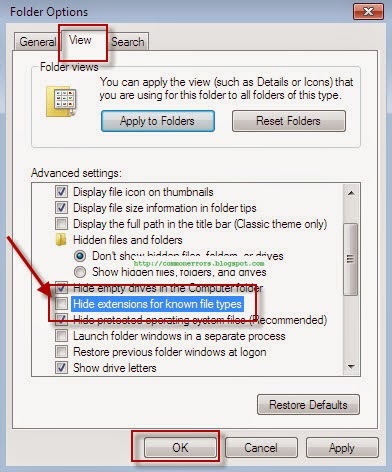 Then from view tab check the checkbox "file name extensions ". this will show file extensions. 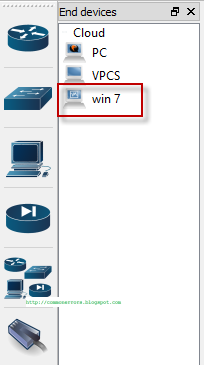 Step 2-rename file and remove extension: now right click on file and rename, remove .exe from it. Windows will confirm from you click on yes. Now you have an unrecognized file, you can attach this to gmail easily without any error message and receiver of this email can use this file by adding .exe extension using above method. 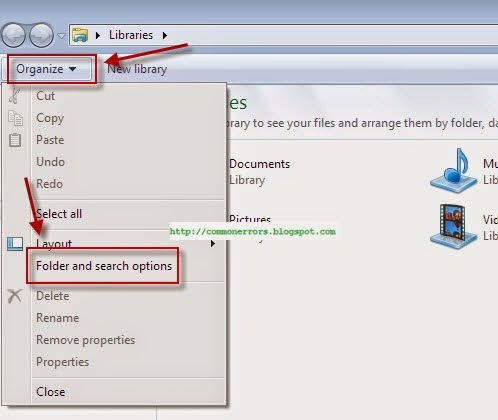 Open the organize\folder and search option from file explore. and then from view tab unclear the checkbox "hide extensions for known files' and click on OK.
now remove the .exe extension from file. In this way you can email an executable file using gmail. 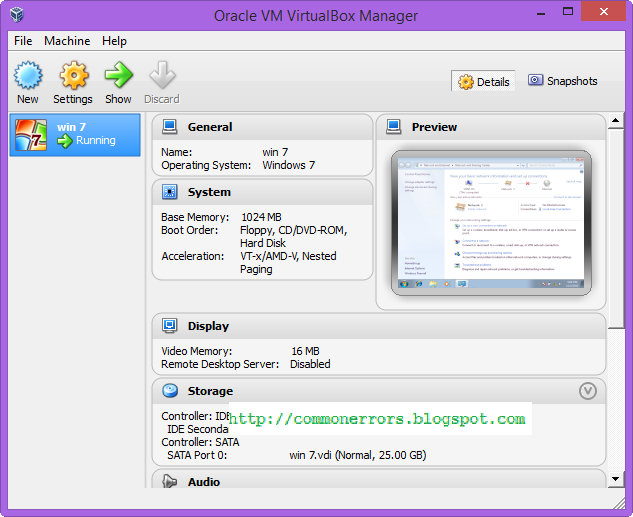 JunOS Olive is a software that you can use on PC. Initially Olive was used by Juniper internally for lab work, but now it become a source to learn the JUNOS CLI on a low-cost platform. Please note Junos olive is only for study and practice purposes , which is unsupported and unsupportable platform & it is not suitable for any type of commercial use. You can actually run this JunOS on VirtualBox and then can simulate this into GNS3. You can Download this JunOS for Gns3 from following link and can perform and configure different lab on Gns3. Click on above link and then choose "download anyway" for download this file. Your company has 14 PCs those need to access the internet simultaneously. 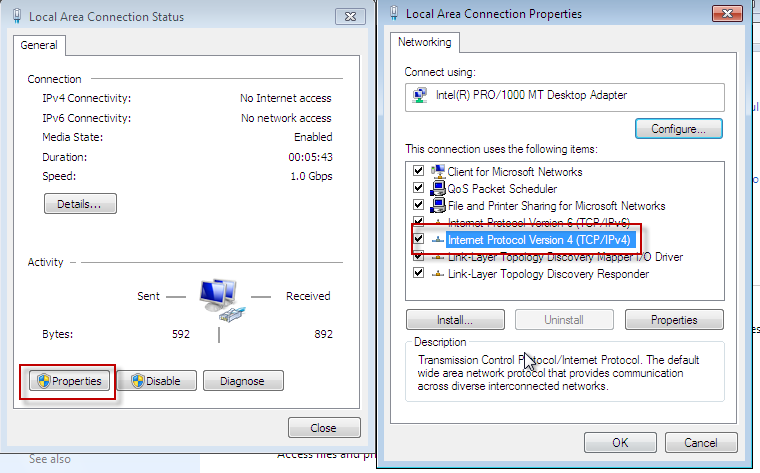 All the computers in the local area network are using the private IP addresses from 192.168.2.1 to 192.168.2.14. You need to configure NAT (network address translation) on PE-router with 4 public IP addresses from 192.168.1.107 to 192.168.1.110 so that all the hosts can use internet at the same time. 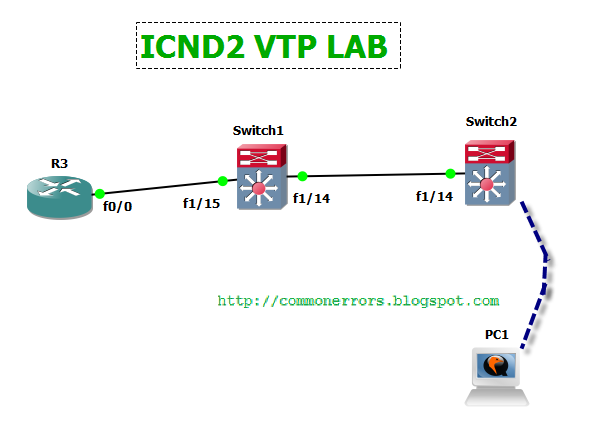 Note: Since we are creating this lab on GNS3 therefore we are using private IP addresses i.e. 192.168.1.X for NAT translation instead of real Public IPs. Please keep in mind that in real scenario you must use Public IP addresses. I have used cloud for internet connectivity with my laptop Ethernet interface, i also recommend you to use physical local area connection of your PC with gns3-cloud instead of wifi-adapter, you learn how to use cloud in GNS3 from here. 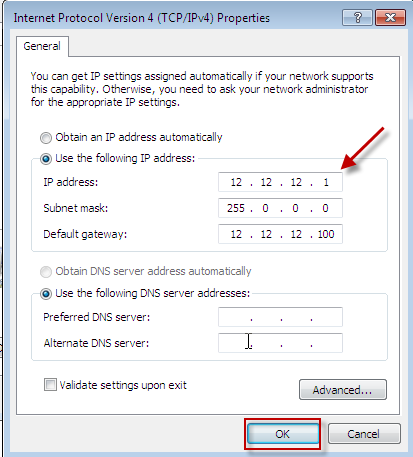 You can learn how to configure IP address and Gateway of VPCS on gns3 from here. Now create an access-list for private IP addresses and permit all hosts. “Overload” keyword allows to map multiple IP addresses to a single registered IP address by using different ports. Ping 192.168.1.1 or some internet address like 4.2.2.2 and then see the nat translations using "show ip nat translations"
VPCS is virtual PC simulator that is now included in GNS3 devices. You can use it for testing purposes on GNS3, you can ping, traceroute etc with VPCs on GNS3. 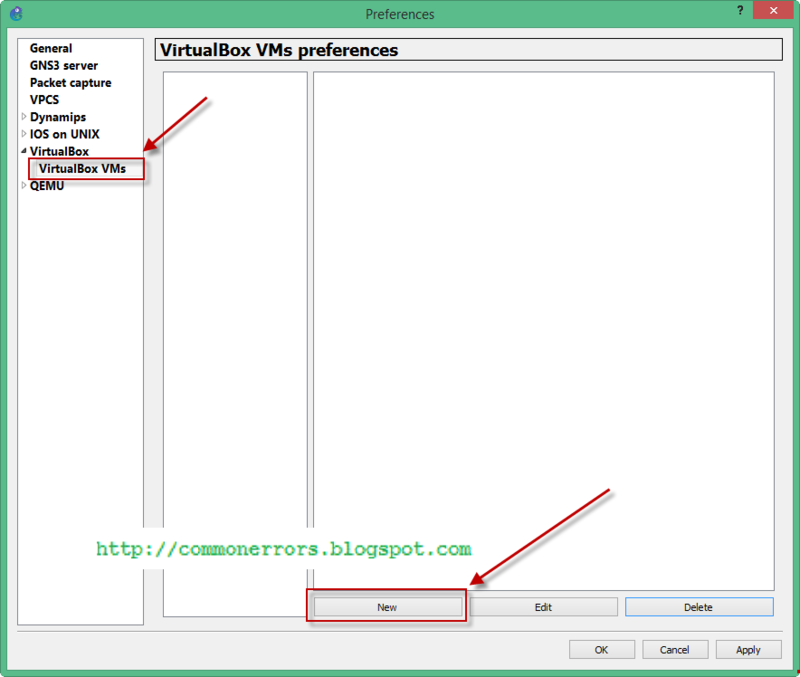 VPCs is already included in GNS3 1.1 and some earlier versions and also you don't need to perform any additional setting for it. 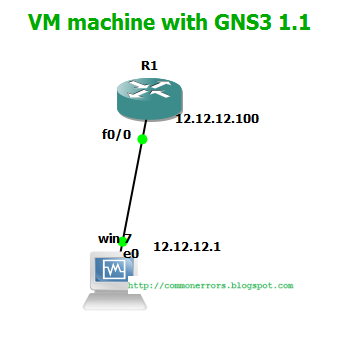 In following figure you can find the default settings of VPCs on GNS3 1.1, which normally works great..! 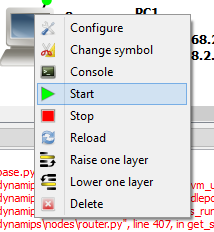 Drag the VPCS from end-device on Gns3 dashboard, right click on it and then on start. It will boot in few seconds. 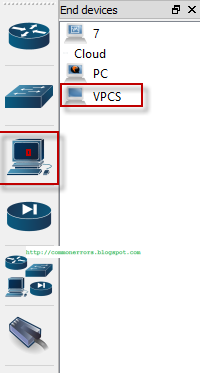 For configuring IP address and gateway right click on VPCS and then on console. 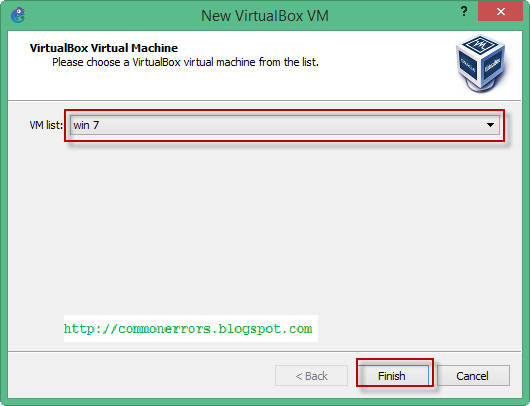 You can use the following command for configuring IP address and gateway for this virtual PC. Configure first available IP address for S1/0 with second usable subnet from the network 192.168.224.0/28. From above table you can find following subnets with the increment of 16 for 192.168.224.0/28. If you have any trouble/issue with R3 configuration you can also download R3 configuration from here and can compare it to your configuration.